[Click image to close] By law, at any time - day or night, when driving in Europe you must convert your headlamps to avoid dazzling other road users. UK Vehicle headlamps are specifically designed for driving on the left hand side of the road. Consequently, when driving on the right in Europe your headlamps will shine into oncoming traffic. This will severely dazzle other road users, is dangerous, illegal, and must be prevented at all times - night or day (including, rain, fog, etc.). Before driving on the continent, always ensure your vehicle is LEGALLY FIT FOR THE ROAD by adapting your headlamps. 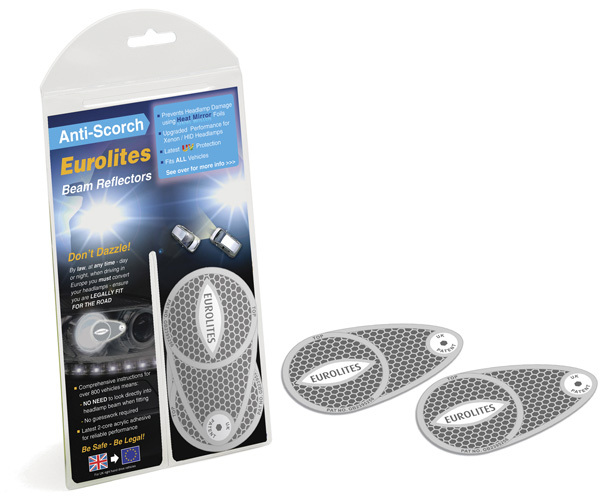 Eurolites are easy to fit and are supplied with individual fitting instructions for over 800 vehicles for the latest 'Clear Glass', 'Projector' and 'Xenon / HID’ headlamps, along with instructions for traditional headlamps with 'line patterns in the glass'. Travel Spot is still the ONLY company to test ALL new vehicles to ensure accurate, safe and legal adaptation of the headlamps. These are for Left Hand Drive vehicles BUT with an English language instruction sheet. They are specifically for English speaking drivers who are coming back to England in a ‘European’ car and need to convert the headlights for use in the UK. They are also often used for getting a European car through a UK MOT test. 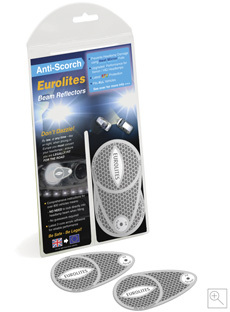 Click here for more information on using Eurolites for MOT’s. 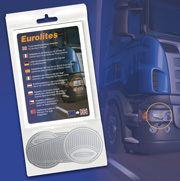 These are specifically for Truck use and include multi-lingual instructions for ALL truck specification headlights. Anti-Scorch Technology using Heat Mirror foils - ensures the extra heat / light generated by Xenon HID / projector headlamps is reflected back into the headlamp to optimise the beam pattern and prevent scorching to modern polycarbonate headlamps. Latest 2-core Acrylic Adhesive - for reliable performance even on curved headlamps. Enhanced UV Protection - affords excellent performance, even for those staying in Europe for longer periods.